Panoramic navigation between the islands of: Venice, Murano, Burano, Torcello, Sant 'Erasmo, San Francesco del Deserto, San Giorgio .. Choose carefully the area of your table! sitting on the prow/stern area. The prow is the most private area of the boat, with only two small portholes at the top and with no view on the outside. The stern area is connected to the kitchen/bar and has small windows for a partial view on the outside. In both prow and stern areas, the tables are set up for 4 seats, so couples could be aggregated according to availability (the tables are still big enough to allow each couple their own privacy). The panoramic upper decks are accessible to all guests during the dinner. Nach unserer Hochzeit auf der Galleone haben wir unseren 1. Jahrestag beim Dinner dort verbracht. Das Essen war wieder fantastisch und die Crew einfach top und extrem aufmerksam. Wir wurden 3 Stunden verwöhnt mit angenehmer Chill-out Musik im Hintergrund während die Lagune an einem vorbei rauscht. Ja, es ist nicht günstig - aber jeden Cent wert! Very friendly service and great food. If you want to make your trip special...book this. Fantastic evening. Celebrating my wifes birthday and she was firstly very surprised that I had prebooked something in Venice (so simple via web) and then surprised at how wonderfully romantic the boat and evening was. lovely piped music. wonderful sea food. Une très belle soirée romantique ! Tout a été parfait ! L'accueil, le service et le repas, un vrai délice. Une balade de nuit fort romantique et très originale ! A faire, vous ne le regretterez pas. The food was wonderful and it just kept coming. Every thing was included, no extra charge for wine or desert. Staff was friendly and attentive. Be careful and don't stuff yourself on the first courses because there is much more to come. Also be sure to go up on deck and enjoy the night time views of Venice. The dinner cruise was great. The ship was beautiful, the service was perfect, food delicious and all extra requirements due to my food allergies had been perfectly organized. Es la 4 vez que lo hago, recomendable 100%. Whenever I travel I always look for that unique experience, the Galleon dinner cruise in Venice was exceptional for interest, variety and quality. I had four guests who were unaware of my arrangement for this trip, and they are still talking about how much they enjoyed this surprise. The most outstanding aspect was the quality of everything, the wine and food were exceptional, the atmosphere created by the staff was 5 star and the Galleon itself and the cruise around the islands was fun. Regarding value for money , initially on booking I considered would this be worthy of the cost ? Now in retrospect , I consider it to be one of the best value for money adventures I have ever undertaken. We had a good time, it’s romantic, the boat is beautiful, the food is nice, the waiters are very professionals. Down side is that we didn’t move from the Harbor because of weather conditions with took a lot off the experience and made it a bit expensive for what we got. My husband and I celebrated our 39th wedding anniversary on 03/13/2019. I got the exact table I requested with Federica several months earlier. I had initially requested the fish menu, then changed to meat. She was very patient with me, because I wanted it to be perfect. I’ve taken numerous dinner cruises and Sunday brunches in the USA, Ssn Diego and Marina Del Rey over the past 10 years. But this was Venice, on a vey special day. The ambiance romantic, the food delicious, the wine, excellent and the music was on point. It was everything, I’d hoped for. We enjoyed ourselves immensely, it’s worth the cost. Coming to Venice is once in a lifetime experience for most people, why not experience all that you can, while you can. You ask communicate you our appreciation of the evening of February 26, 2019 on your Galleon in Venice. In General, satisfied with the music, the decoration of the room, the ballad at sea, the wines served and in particular the Prosecco, the friendliness of the waitress. What about dinner, my daughter has been pleased with its meat menu ; on my side, a bad note for Nephrops whose flesh in a small cube of I don't know what proved to be sticky to the tasting, scallops could not be found in a rather tasteless sauce. Bad note also to have forgotten we serve wine when our glasses were empty! (the french are known to love wine, even if we in particular, drink it in moderation!...). A note to add, fruit skewers with the Tiramisu. Difficult access to the port of loading to a person with a cane, a lot of stairs. Overall we would recommend this dinner cruise. Buena comida y abundante, buen servicio. Una experiencia única. Nos encanto. È stata una fantastica serata che consiglio a tutti, ottima atmosfera, ottima cucina e personale gentile. In particolare volevo ringraziare Pamela per la cordialità. Esperienza indimenticabile, staff molto attento e cordiale, cucina raffinata e molto curata nei dettagli. Consiglio! You get plenty of food which we weren’t expecting. 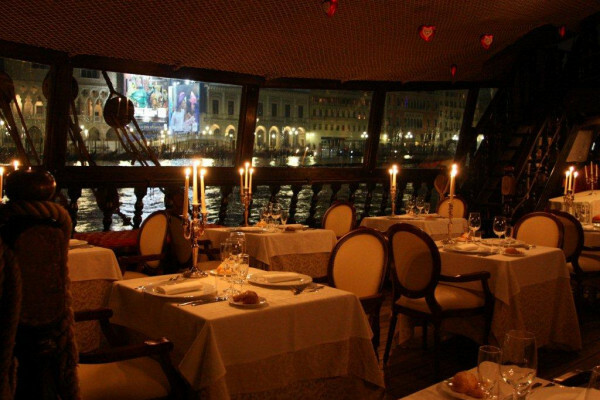 You can really beat the setting - on the Venice Grand Canal, in a galleon, candle lit dinner, with superb service. Make the most of the wine because they keep bringing it - with no extra expense!! Esperienza unica, il massimo del romanticismo, cena e servizio eccellenti. Da provare una volta nella vita. Il Galeone Veneziano è vivere Venezia da una prospettiva diversa, esclusiva. La luce soffusa delle candele, un sottofondo musicale romantico, i calici di vino, una cena di pesce raffinata, il calore del legno, le isole della laguna come cornice alla serata...Tutti ingredienti che creano un'atmosfera senza tempo, in un'emozione d'incanto. The food was amazing, the staff was professional and attentive. My only complaint would be where we sat, we couldn’t see any of the islands which was unfortunate. The staff went above and beyond for a very picky friend of mine who wasn’t a huge fan of seafood or raw things. They made sure she ate something she liked after 3 plates of food not being touched. I highly highly recommend this. Serata bellissima, il galeone è raggiungibile facilmente con i vaporetti. Tutti molto cordiali, cucina semplice ma di qualità. Vista impagabile, d’estate deve essere ancora meglio! È stata una bellissima esperienza cenare con vista sulla laguna di Venezia. Sono andata con mio marito a festeggiare San Valentino come regalo di compleanno dei nostri figli e non potevano pensare a un regalo più romantico, piacevole e rilassante di questo. Staff gentilissimo e attento, atmosfera magica, esperienza unica: un galeone pieno di tesori!! Certamente da consigliare . Pietanze un po’ troppo ridotte per la mia stazza ma comunque molto buone . Location insolita e suggestiva,come le acque che solca!magari in estate,con la luce del sole,il paesaggio ci guadagna,ma per me,la laguna,sotto la luce bianca della luna ed una leggera foschia,non ha paragoni!!! !